As our beans start to put on pods, it’s time to start scouting for stink bugs. In 2016 a number of farmers had significant stink bug damage but didn’t realize it until harvest, when they discovered shriveled, blasted seeds. 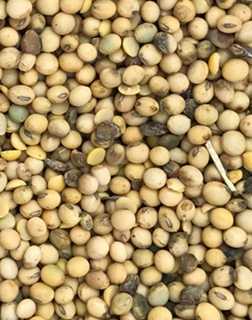 Seed damage can be prevented by scouting and treatment at appropriate threshold levels. There are several sp ecies of stink bugs that can be found in soybean, even beneficials. These include the green, the brown, the red shouldered and the brown marmorated stink bug. The spined soldier bug looks similar to the brown stink bug, but has sharper points on its shoulders, and is more brown on the underside (the brown stink bug is actually more green underneath). Both nymphs (immatures) and adults feed on the developing seed by using their piercing/sucking mouthparts to poke through the pod. Seed that is fed upon will take a flat or shriveled appearance. Often this damage is not seen until harvest time, because the pod usually retains its shape, despite the smaller seed. Therefore it is important to scout early and control if necessary. Most insecticides labeled for soybean include stink bugs on the label, and most are adequately effective. Keep in mind it is easier to kill immatures than adults. To sample for stink bugs, take multiple 10-sweep samples with a sweep net in multiple locations throughout the field. Average the number of stink bugs in the 10-sweep samples. The threshold to treat is 4 or more stink bugs (adults and nymphs combined). If soybeans are being grown for seed, the threshold can be dropped to 2 or more stink bugs.